Betrally is a sportsbook that was established in 2013 and licensed in Curacao. Since its inception, Betrally has morphed into a trusted online gambling site that covers almost every major sport (and some minor ones) available. Basically, if you can bet on it, Betrally has you covered. Furthermore, their app is easy to use and compatible with most mobile devices on the market. In addition, Betrally gives you various betting options like over/under and alternative totals. You can also choose from Asian View or traditional overview when it comes to how you like to see your betting options. Betrally provides you with different deposit options based on your needs. Choose from Visa, MasterCard, Entropay, Skrill, Neteller and ecoPayz to easily make your deposit. Making a withdrawal is simple and there are also betting maximums and minimums you can look into. Make sure you look at the Terms and Conditions when it comes to deposits and withdrawal. This will give you a better understanding on how long it takes to collect your winnings. Usually, the time it takes for a withdrawal to be processed depends on the deposit option you’ve used. The bonus options at Betrally are pretty decent. With a Welcome Bonus of 100% up to $7,500 INR, you’re treated to a great opening offer. What Sports Can I Bet on at Betrally? Betrally is one of those sportsbooks that offers a wide variety of sports for your betting pleasure. Besides popular sports like cricket and football, everything from ice hockey to rugby union is waiting for your wager. You’ll also find netball, water polo, snooker and pool, cycling, darts, American Football, chess and MMA. What casino games are available at Betrally? Like most online casinos available, you can choose from a wide variety of games like blackjack, craps, baccarat and various forms of poker. However, it is the slot machine selection that is truly diverse. Everything from Battlestar Galactica to Rock Star to Jumanji to Football Star are offered here. 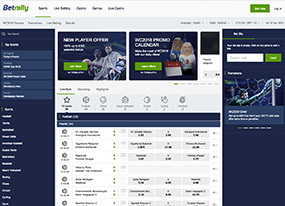 Featuring software from the best casino game creators on the planet like BetSoft, GameOS, Micrograming and NetEnt, the Betrally casino is perfect for those in the market for more than just a simple sportsbook. Does Betrally have a live dealer casino? Betrally does indeed have a live dealer casino with games like roulette, baccarat and blackjack. The games are broadcast from a professional studio and the interactive features let you chat with the other players and the dealer. What are the Pros and Cons of Betrally? You’re not alone when you choose to place your bets at Betrally. The site is one of the preferred sportsbooks for gamblers in India, Italy and most of the world (see Languages Offered below). So, when you make your wagers at Betrally you’re betting amongst like-minded bettors who are looking to get a competitive edge, have fun and make a few bucks. Betrally hasn’t become one of the most trusted betting sites for no reason. Their competitive odds and quick payouts have helped them secure their spot in the lineup of great online sportsbooks. Moreover, the variety of sports they offer along with alternative betting markets give them an edge over the competition. Plus, they offer live betting so you can place your wagers in real-time and Asian handicaps (when teams are handicapped according to their form to reduce the number of betting outcomes). One of the major pros of Betrally is their customer service department. You can contact a live representative through their chat system 24 hours a day to help you navigate the website, ask questions about your account and deal with any problems that may arise. Unfortunately, Betrally has restrictions for certain countries. If you’re in the United States, Israel, France, Bulgari or the United Kingdom, you’re out of luck. Betrally doesn’t operate in your country. However, it does operate in most countries like India, Portugal and Italy. Another con of Betrally is there limited video poker selection. If video poker is your thing, you won’t have as many options as other online casinos. But, that doesn’t mean that what they do offer is unworthy of your playing time. It’s simply limited, that’s all. Betrally is available in English, German, Portuguese, Italian and Russian. You can easily select the language you want from the language bar at the top of the page. Each language is represented by the corresponding country’s flag. Is Betrally a good option for me? With over 60,000 unique weekly betting events that cover more than 2000 bet types on over 60 sports world-wide, the majority of people who use Betrally really love it. If you’re looking for a betting site that offers ease-of-use, great betting options, live dealers and fast payouts, you’re probably going to love Betrally too.